It’s been a while since I’ve posted an Asian-Inspired recipe… my favorite kind of recipe I might add. I was on my own for dinner the other night and was inspired to finish up the package of Soba Noodles I bought earlier this year for my Soba Pasta Salad. 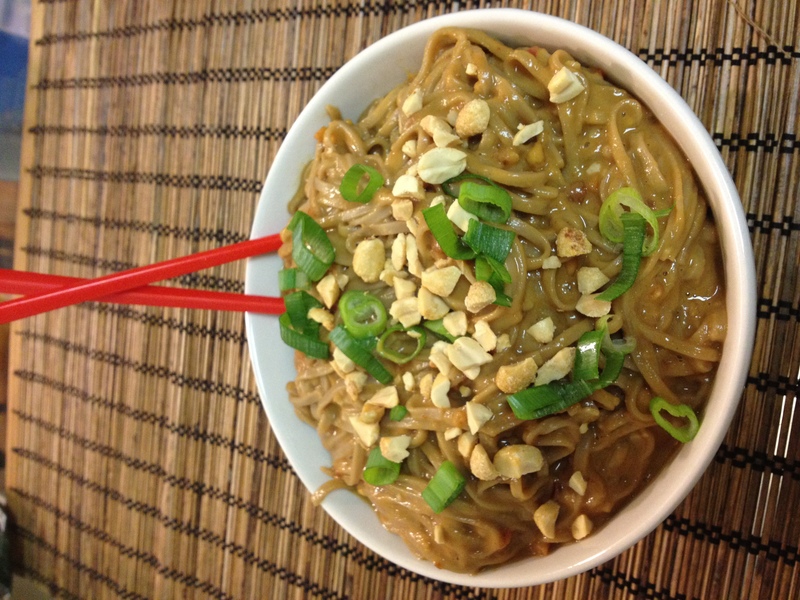 Although the original recipe does not call for Soba Noodles, it worked really well with it. I would probably even say I prefer it to normal spaghetti or the recommended Udon noodles! 1. Cook the Soba Noodles according to directions on package. I boiled water, threw in the pasta and let it boil for a minute, then turned it down to a simmer for 3 minutes. I drained over a colander and ran it under cool water until they cooled off a bit. Set aside. 2. Combine the chicken broth, soy sauce, both peanut butters, honey, garlic, and both chili sauces in a small saucepan over medium heat. Heat and stir until peanut butter is melted. Cook for about 5 minutes or more until the sauce thickens a little. 3. Toss pasta with sauce. Let sit for 10 minutes in the refrigerator (if you want) while you chop the Green Onions and Peanuts. Stir the pasta again, the sauce should become thicker. Top with the Green Onions, Peanuts, and Sesame Seeds. I love green onions, and they’re really good on here! This recipe is amazing served cold, or you can serve it warm if you’d like too! It is very similar to “Cold Sesame Noodles” or “Szechuan Noodles” found in most take-out Chinese restaurants. BUT- of course… it is much better. The noodles are so soft without being mushy, they worked really well with the thick sauce. 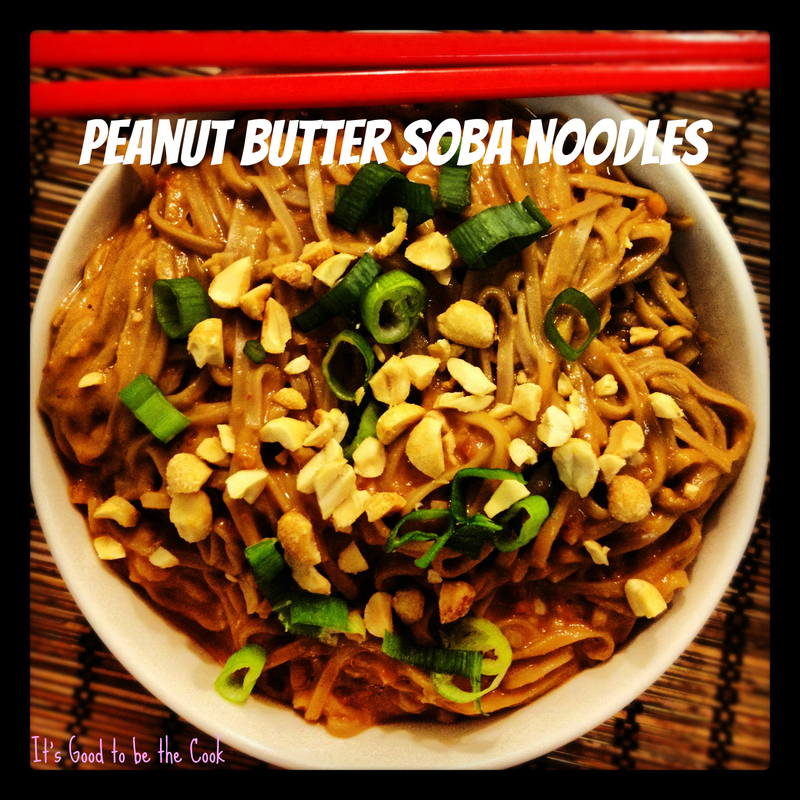 I used Reduced Fat Peanut Butter for both my Creamy and Chunky and also Low-Sodium Soy Sauce in there. I try to make healthier decisions as much as I can, and save on fat, sodium, or calories wherever I can. It normally doesn’t compromise the recipe either. I promise. Does anyone else have a good Soba Noodle Recipe? I love them!